Choose from 251 hotels and guest houses in North Yorkshire. Shown below a just a selection of the hotels available. To search within an area please use the menu on the right. Only a short walk from the centre of Harrogate and with free on-site car parking, the Bijou has 10 stylish and contemporary boutique rooms, all with en suite facilities. Attractive and elegant, all of the Bijou's rooms are individually designed and decorated, each with their own unique charm. Most of the light and airy rooms have excellent views over Harrogate. Every room has an LCD flat-screen TV and a DVD player. A DVD library is available on request. Charming extras are included, including tea/coffee making facilities, biscuits, jelly beans and fudge. All rooms are en suite, with a shower, a bath with shower taps or both. Dressed in crisp white linen, the rooms feature waffle bathrobes and bespoke Bijou-branded toiletries and luxurious bathroom products. Free wireless internet is available in the public areas. Stylish, yet relaxing, the Bijou is the perfect retreat for a stay in Harrogate. The town centre is just a short walk away, as is Harrogate International Centre. Dating back to 1640, Georgian House is just 250 metres from York Minster and is the closest guest house to York's historic centre. This Grade II listed town house has en suite rooms and a private car park. Rates include full English breakfast. A recent ?4 million refurbishment has transformed this Victorian mansion into a stylish and contemporary hotel, surrounded by 8 acres of parkland and 45 acres of tranquil North Yorkshire countryside. Burn Hall Hotel is just 17.5 km (11 miles) north of York on the A19 and 21 km (13 miles) south of Thirsk. 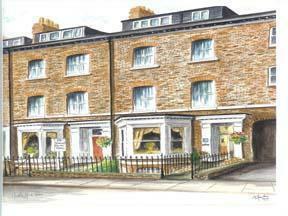 This is the ideal location for a short break in York, close to all the major attractions of the city centre. The hotel is also ideal for visiting the North York Moors and Yorkshire Dales. Burn Hall is a member of Classic British Hotels. 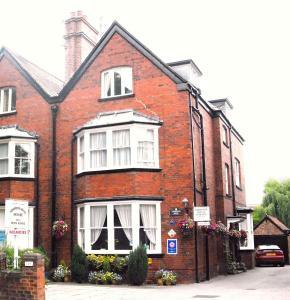 Hedley House Hotel is situated in a quiet residential area, within an easy 8-minute walk of the centre of York. Under the same family ownership since 1984, all rooms have recently been refurbished and most have large flat-screen TVs. 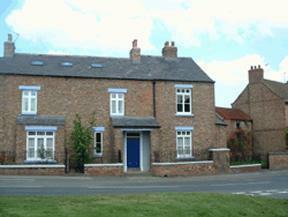 Hedley House was tastefully converted in 1984 from 2 Victorian town houses. It has its own private car park - important in York where parking is at a premium. There is a lounge bar for the exclusive use of guests, where home cooked evening meals and snacks are served. In the summer there is a barbecue area and a 6 person outdoor aqua spa on a garden deck for your enjoyment. New conference facilities have been added and that can cater for up to 16 delegates. Situated within a pleasant residential area of York, this charming Victorian property is ideally located for great access to the city's fantastic selection of restaurants and attractions as well as the wider Yorkshire area. Owners Paul and Julie will offer a very warm welcome and excellent hospitality to all, giving personal attention and ensuring a homely atmosphere in their 7 spotless and cosy en suite bedrooms. Paul and Julie are particularly proud of the quality of their breakfasts, prepared with locally sourced ingredients, from fresh outdoor-reared pork sausages, rashers of locally cured bacon and free range Yorkshire eggs, to freshly baked croissants. The centre of York is a pleasant 20 minute riverside stroll away, and for those who wish to conserve their energy for sightseeing, there is a frequent bus service into the city centre. We are also conveniently situated for York racecourse, York University and Fulford International golf club. Whether you are visiting the wonderful city of York as a tourist, race- goer, golfer or on business, why not ensure a successful and enjoyable stay by checking in to Ashbourne House - you'll be glad you did! 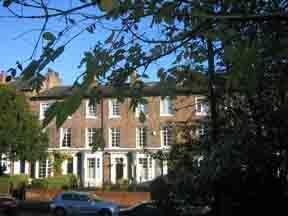 Ashbourne House is registered with and classified as 4 Diamonds by the English Tourist Council and 4 Star by the AA. The high standards maintained have been recognised with a Silver Award from the English Tourism Council. The New Inn, situated a few miles away from Settle, is an 18th century coaching inn that has been lovingly and carefully restored to offer quality accommodation. Set in the magnificent Yorkshire Dales National Park, this hotel offers high standards of accommodation at affordable prices and is ideal for visiting many places such as the Lake District, Leeds and Lancaster, or enjoy a trip on the Settle/ Carlisle Railway. 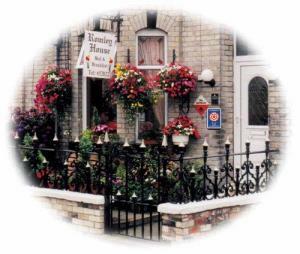 Situated in the centre of Scarborough, within easy reach of local attractions, this family-run bed and breakfast presents itself as the ideal base to explore the popular seaside resort. Located on North Marine Road, if you turn left out of the door it is only a 5-minute walk to the beach and the Peasholm Park area where the new Sands complex is being built. Turn right out of the door and it is just a short walk to the town centre. The Marina Bed and Breakfast is a basic home-from-home bed and breakfast run by Paul and Svetlana Lester. Every room has a TV and tea-making facilities. All rooms are newly decorated and the owners have completed another refurbishment and installations. The Holgate Bridge is close to the centre of York, one of Europe's premier historic cities. At the centre of Yorkshire, York is an ideal centre for visiting the county's many attractions. A warm welcome awaits you at our friendly, family-run establishment, offering comfortable accommodation only 10 minutes walk from the historic city centre. We boast a large car park for our residents during the period of stay. Check-in time indication is required on booking - the latest being 22:00 hours, unless prior arrangements are made. Less than 3 miles from elegant Harrogate, this excellent hotel has a restaurant with 2 AA Rosettes, and an 18-hole golf course that runs through the 18th-century parkland. The modern rooms at Rudding Park overlook the gardens or the chapel, and are comfy, stylish and well-equipped. The open fireplace and fresh flowers in the reception create a warm welcome that is extended by the friendly and helpful staff. Clocktower Restaurant & Bar uses fresh local ingredients in its award-winning cuisine. Rudding Park is within easy reach of Leeds, York and the motorway network. The distinguished golf course architect, Martin Hawtree, designed Rudding Parks 18 hole golf course, and the more recent 6-hole short course. Guests are offered free passes to 2 health clubs in Harrogate, which include a swimming pool. The adjacent holiday park (open seasonally) also has a heated outdoor pool. 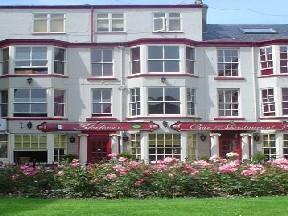 Situated on South Cliff, this newly modernised hotel is fast becoming the place to stay in Scarborough. Some bedrooms have partial sea views. Brooklands Hotel has recently re-opened after a ?1 million refurbishment. The redesigned Victorian building has stylish public areas and bedrooms that are ideal for a relaxing and comfortable break. 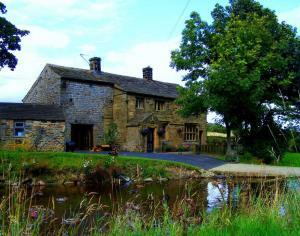 Just off the Pennine Way, this small, beautiful manor house was built in 1596 and is rich in original character and traditional charm. Today, it offers free Wi-Fi and lovely rooms. In the small valley of Stone Head, near Lothersdale and Cowling in North Yorkshire, Stone Head House once served as a working farm. There are only a handful of properties in the hidden valley, all of similar age. The beautiful original building has been carefully preserved and sensitively refurbished. With flagstone floors downstairs and a huge inglenook fireplace in the dining hall, the guest house provides charming bed and breakfast accommodation at very reasonable rates. Small and intimate, the guest house offers friendly, personal service. All of the rooms have tea/coffee making facilities. Breakfast is cooked on the traditional Aga stove in the quaint farmhouse kitchen. A varied breakfast menu is available, including fresh-baked bread, full English breakfasts, smoked Alaskan salmon and oak-smoked kippers from Whitby. This unique hotel gives you the pleasure of experiencing not only the wonders of early 20th century rail travel but also today's railway action on Yorkshire's East Coast Main Line. The Sidings Hotel & Restaurant directly overlooks one of the fastest and most impressive stretches of track in the land: the York to Thirsk run. In this quiet location railway enthusiasts are given the opportunity to thrive in a haven built from a collection of genuine railway artefacts and memorabilia. Guests can relax in the spacious conservatory and enjoy the authentic style of this delightful and intriguing hotel with its friendly atmosphere and panoramic views of the open Yorkshire countryside. An old coaching inn with contemporary comforts, The General Tarleton is in the pretty village of Ferrensby, close to both York and Harrogate. Set in some of Yorkshire's loveliest scenery you will find relaxed comfort, delicious food and fine wines, but above all, it is the team of friendly, helpful staff who will make all the difference to your stay. The hotel is almost exactly midway between London and Edinburgh and only 3 miles from the A1, making it the ideal place in which to break a long journey with an overnight stay or just a quick pit-stop. In a quiet tree-lined road, just a short stroll from Harrogate International Centre and the heart of this charming spa town, this 4-star guest house offers modern rooms and free Wi-Fi and parking. Extensively modernised, the Arden House Guest House has a convenient location, within easy reach of all that Harrogate has to offer, including the town's exhibition and conference centre. All of the fully refurbished en suite rooms are attractive and modern with contemporary comforts and facilities, including TVs, power showers and free, fast wireless internet access. Each room comes with tea/coffee and high-quality toiletries. Arden House is fully licensed, with a well-stocked residents' bar. There is a private car park with security lighting. A substantial breakfast is available every day and is freshly cooked to order. Guests can choose a traditional full English breakfast or Scottish smoked salmon and scrambled egg on toast, along with a selection of cereals, juices, fresh fruits, teas and coffees. Located in the town centre, only minutes away from the beach, railway station and main attractions, the hotel is set within a Grade II listed historic building. Welcoming guests all year-round, whether it's for a short break, holiday or business trip, the hotel presents itself as the ideal base for your stay in Scarborough. 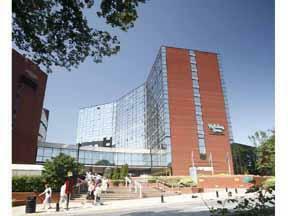 Within minutes walking distance are The Stephen Joseph Theatre, Spa Complex and the town centre, as well as a Shopping Centre, Cricket Ground and Bowling Centre. Although the hotel's central location means that they are close to the main road route around Scarborough, it is fortunate to be set back from this in a small grassed square. Surrounded by the breathtaking scenery of the Yorkshire Dales National Park, this cosy hotel offers luxurious accommodation and superb cuisine, making it a great base for a relaxing break. Austwick Traddock is a cosy hotel in Austwick, just off the A65 between Skipton and Kendal, and just 2 miles (3.2 km) from Settle. With the stunning natural beauty of the Yorkshire Dales all around and many excellent walks leaving from right outside the door, the hotel is a luxurious and relaxing base for walkers or for those seeking a restful break in this beautiful part of the county. Free wireless internet access is available throughout the hotel. Renowned for its charm and friendliness, the hotel is family-run. Your hosts, Paul and Jenny Reynolds, pride themselves on providing a cosy, home-from-home atmosphere and a relaxed, friendly atmosphere. The award-winning restaurant offers traditional favourites, alongside the more exotic, with organic, locally sourced seasonal produce used wherever possible. Chombeys is a stylish farmhouse overlooking the village green at Tollerton, only 15 minutes from the city of York. The village is in the heart of the Vale of York and just off the A19, making it an ideal base for North Yorkshire. Chombeys is a comfortable house across 3 floors, with gas central heating throughout. The rooms are well sized and offer you tea/coffee and a TV. Breakfast is served from 07:30 to 08:00 and features local produce, specially cooked on an Aga. Chombeys prides itself on giving good service and tries to accommodate any special requirements that guests may have. The Brentwood has built a reputation for Fine Food, with achieving many Awards from the Association of Catering Excellence for quality and presentation. You will find our spacious dining room both relaxing and the ideal place to start the day. Located just a 10 minute walk from the city centre, With parking facilities and close to the Railway station, the Brentwood provides the perfect base to explore York. We are always happy to provide you with visitors information and local knowledge. This small guest house, full of charm and character, is ideally situated close to Scarborough's fabulous South Bay beach and within easy reach of all the main attractions and amenities. Extensively and tastefully refurbished with style and quality, Alexandra House offers you the very best in comfort and quality. However long you choose to visit, the owners, David and Carol, ensure you of a warm welcome and a comfortable stay. 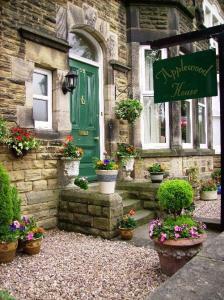 Quality, independent hotel with many Victorian features, just a short stroll from Harrogate's conference & town centres. Visit Britain Silver Award for properties achieving the highest levels of quality within their Star rating. The Ascot House was originally built in 1892 by Mr W H Baxter as a traditional Victorian family residence. It has now been elegantly transformed into a 19-bedroom hotel. 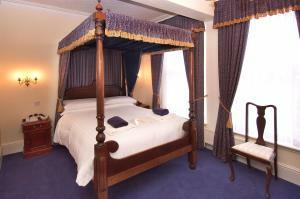 Superior and Four Poster rooms are the larger rooms. The Ascot Room, a cosy sitting room with open fires in the winter, is the perfect place to enjoy afternoon tea or just curl up with a good book. Relax in comfort in the informal friendly atmosphere of our lounge bar - or take in the sunshine on the patio balcony. Enjoy the evening in our elegant restaurant which offers traditional English and Continental dishes, prepared using the finest fresh produce. Complement your meal with a bottle of wine from our well-stocked cellar - many imported direct for extra value. Breath-taking gardens and floral displays have earned Harrogate wide acclaim and the traditional Turkish baths and Royal Pump Room Museum are well worth a visit. You will find some of the best shopping in Yorkshire, together with lively restaurants, wine bars, night clubs and theatres. A wealth of attractions including stately homes and historic castles lie within a short drive, together with the stunning scenery of the Yorkshire Dales and North York Moors. Our hotel is situated within the North Bay of the popular North Yorkshire seaside town of Scarborough. We are close to all North Bay amenities, as well as having easy access to the town centre and south bay. The hotel offers bed and breakfast with the option of a home cooked evening meal. The friendly atmosphere is designed to make your stay both comfortable and happy. All our rooms are en suite with a comfortable and relaxing atmosphere. Evening meals, bar meals and packed lunches are available. Guests have their own keys with access at all times. Backing onto a pretty square, this Grade II listed house within a Victorian terrace has been lovingly restored to retain the ambiance of a private home with elegant rooms. Holmwood House features a comfortable sitting room with an open fire. Breakfast is their speciality, with a wide selection including Craster kippers. Special diets can be catered for with prior arrangement. Holmwood House is west of the city walls, which are just a short walk away. The wonderful York Minster and The Shambles, as well as the Jorvik Viking Centre, the Railway Museum and many other attractions are within easy walking distance. It is also conveniently located for the railway station, for easy access to the Yorkshire countryside, Scarborough and Whitby, as well as the beaches at Filey and Robin Hood's Bay, and the uplands of the Wolds, the Moors and the Dales. Right on the seafront, overlooking the golden coastline of Redcar and only 5 minutes from the railway station, the Park Hotel offers free Wi-Fi, free parking and attractive en suite rooms. 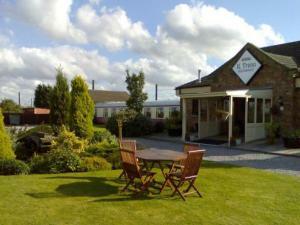 The Park Hotel has a convenient location, with easy access to the A1(M), the A66 and the A19. All of the region's business centres are within easy reach, as are Teesside Park, Middlesbrough and the heart of Industrial Teesside. The scenic port of Whitby, made famous by Bram Stoker's Dracula, is just a little over 20 miles (32 km) away. Redcar Central Railway Station is just a 5-minute walk from the hotel. 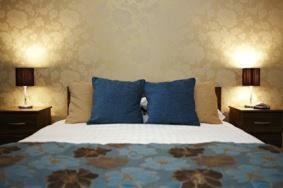 All of the comfortable and beautifully appointed rooms have satellite TVs, hairdryers and tea/coffee making facilities. The restaurant offers an extensive ? la carte menu, alongside the ever-popular carvery, with a delicious choice of roast meats accompanied by a selection of seasonal vegetables and potatoes. The Lounge Bar also offers a choice of bar meals. On Scarborough's South Cliff, this charming hotel is within easy reach of the spa, conference centres, beach, town centre, railway station and the Stephen Joseph Theatre. 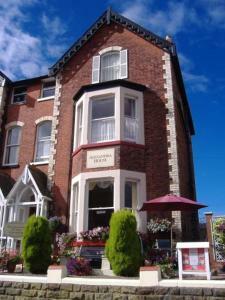 Close to the very heart of Scarborough, the Granville Lodge Private Hotel has en suite rooms with TV and tea/coffee. Small and privately owned, the Granville Lodge Hotel prides itself on offering a friendly atmosphere and excellent service. A 4-day on-street parking permit is available from the hotel for a small additional cost. The Fountains is a Victorian House built in 1891 and is situated in the ideal position for both tourist's and business visitors to the area 5 mins from town. The Fountains is a 4 Star Guest Accommodation establishment which offers 10 individual styled bedrooms all of which are en-suite. We are a family run business and can assure you of a warm welcome and a friendly atmosphere during your stay with us. We have a non smoking policy through out the building for the safety and comfort of our guests. Situated on the west side of the city, this 3-diamond classification guest house is ideally located within a 10-minute walk of the railway station, racecourse, city centre and all its main attractions. After a long day of exploring the historic city centre, you can return to the comfort of the guest house which offers fully-equipped en suite rooms, a licensed bar and a comfortable lounge with satellite television and complimentary tea and coffee. Furthermore, the house is double glazed and central heated, ensuring a peaceful and cosy stay. Offering Yorkshire hospitality at its finest, Romley House prides itself on the number of guests who return time and time again.